The Problems have become self-aware: Introducing the Skynet line. I had a great twitter conversation tonight with a bunch of people about the topic of “authenticity.” That is, what’s the relationship between pure mathematical investigations (like, say, this one – a problem I absolutely love), versus a more concrete, applicable problem (like, say, this one – a problem that I also love). It’s a piece of curriculum design that’s never settled quite for me. Am I developing problems that are not authentic enough? Am I artificially making problems authentic? And does doing that make them inauthentic by definition? Is it a balance? A 2-to-1 ratio? Which way does that ratio point? I was going to blog about it, but A) I should probably have something mildly-intelligent to say about a topic before I write about it, and B) David (@delta_dc) already did a year ago in a much more coherent manner than I could have attempted. I began to think about “good authenticity” vs. “bad authenticity” which I made up on the fly. Bad authenticity is when a mathematical concept gets something real world-ish grafted on to it. You know, psuedo-context. It got me thinking about something Dennis Littky says about “fake real world problems” vs. “real real world problems.” Contrary to Littky though, I think “fake real world problems” are fine, so long as they understand that they’re “fake real world problems.” The famous cabbage-chicken-fox-boat problem is “fake real world” but that’s ok since we all understand that it’s a fun mental exercise. 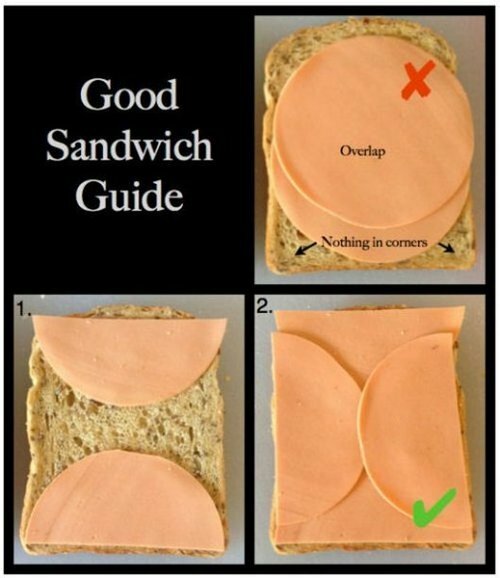 Ditto for the farmer/fencing problems present in many Geometry classrooms. You don’t need to take a field trip to a farm so kids can have a real world experience to figure out the optimum shape of fencing for a pig pen. It’s fine if a problem is inauthentic or contrived, so long as it knows it’s inauthentic or contrived. Obviously we want kids to have tons of authentic, real-world experiences in math. Practically though, we are limited by budgets, time, logistics, standards, and creativity. So we ought to pick and choose what we want to be supremely authentic and what is contrived. And whatever is contrived ought to be up front about itself. To that extent, I’d like to introduce the Line of Problem Self-Awareness, or Skynet Line. 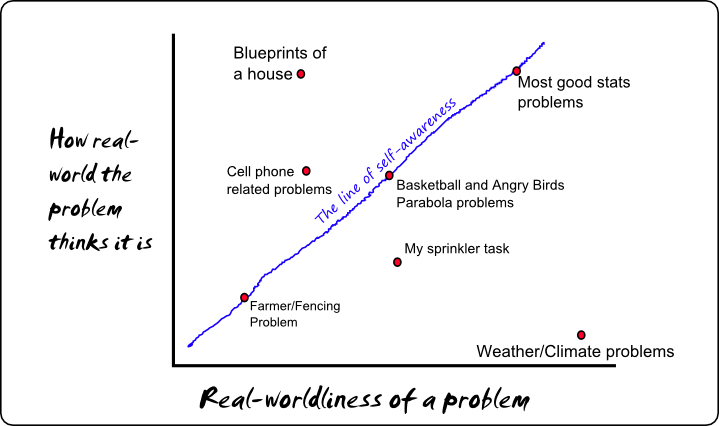 Basically the way it goes is this: problems vary in “real-worldliness”, which is fine. But problems also vary in how real world the problems think they are. Ideally a problem ought to be self-aware of its own “real-worldliness” whether it’s super authentic or a contrived problem scenario intended at getting into math content. Ideally, a problem lands directly on the Skynet Line (y=x). Problems above the Skynet Line think they are being authentic when they’re really not (sorry peeps, architects don’t use Geometer’s Sketchpad to design a house, nor do they require that there be a hexagonal room). Problem below the Skynet Line are shortchanging their own authenticity and could probably stand expert input or more physical investigation. Obviously similar problem scenarios could move all over the graph depending on how they’re posed, facilitated, and concluded, so don’t get too bent out of shape about any of the particular items on the graph above. I always want to push teachers to make their problems more authentic. It’s invaluable to have a student see a straight line connection between a mathematical concept and something they can see, touch, and behold. I certainly don’t want to give teachers an easy out by invoking Paul Lockhart’s name and washing their hands of all authenticity. However, believe it or not, sometimes students enjoy contrived problems. Ever played Clue? It’s basically one big contrived logic problem and they made a movie out of it. So while I want to push for authenticity, I do want teachers to at least know whether or not their problems are self-aware.